WITH RESPECT TO THE TRADITION OF CYCLADES, THE YOUNG OWNER SANDRA MARIA CREATED AN ELEGANT ,MINIMAL STYLE VILLA WITH LOVE AND PASSION. 140M2 IN 2 LEVELS, FURNISHED WITH HIGHT QUALITY FURNITURES AND APPLIANCES. THE ASTONISHING VIEWS OF THE SEA FROM EVERY CORNER OF THE VILLA ARE UNIQUE.IN THE SPACIOUS OUTSIDE AREA ,TRAVELERS ENJOY 3 DINNING CORNERS WITH BIG TABLE FOR 12 PEOPLE ,A GLASS TABLE FOR 5, AND A BAR WITH 4 STOOLS .DRINKS ARE FREE.. IN THE BAR YOU CAN DRINK YOUR MOHITO, OR BETTER A GREEK OUZO, WHILE AT THE SAME TIME COOKING YOUR BREAKFAST OR GRILL YOUR FISH .. BEAUTIFUL PRIVATE SWIMMING POOL FROM WHERE YOU CAN ENJOY THE SUNSET.AT NIGHT, GORGEOUS VIEWS OF THE CAPITAL 'IOULIS'. THE VILLA IS SITUATED ON A SMALLCLIFF , MAINLY WEST ORIENTED ,HAVING VIEWS IN THE NORTH, IN A LAND OF 4000 M2, SHARING THE AREA WITH 2 OTHER VILLAS OF THE SAME ARCHITECTURE AND PHILOSOPHY. LIVING ROOM AND KITCHEN IN THE SAME OPEN SPACE . 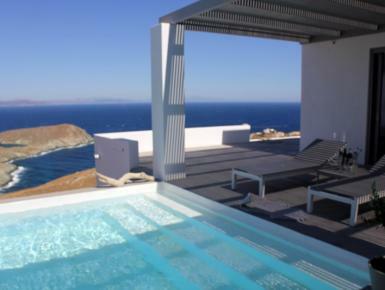 BIG OPENINGS ALL AROUND ALLOW YOU TO OVERLOOKING THE SEA.THERE ARE 3 BEDROOMS WITH 3 EN SUITE BATHROOMS. IN ADDITION THERE IS A LOVELY PLAY ROOM WITH TWO BIG WHITE SOFAS .